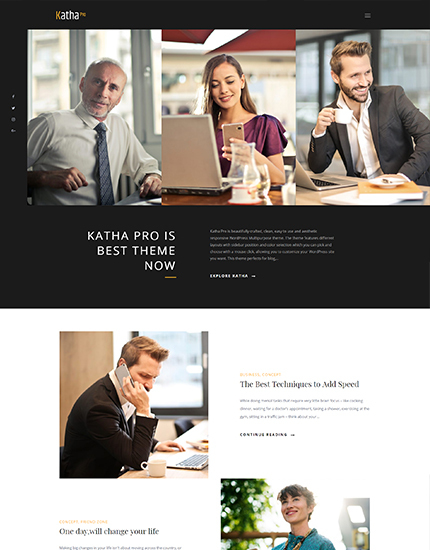 Katha Pro by ThemePalace is a beautifully crafted, clean, easy to use, aesthetically pleasing and responsive WordPress Multipurpose theme built with flexibility in mind as its unique design is primarily apposite for architectural and engineering websites. The theme features different layouts with sidebar position and color selection which means you can pick and choose with different layouts and designs with a mouse click, allowing you to customize your WordPress site the way you want it and tailor it to your needs so that no website will ever look alike to yours. 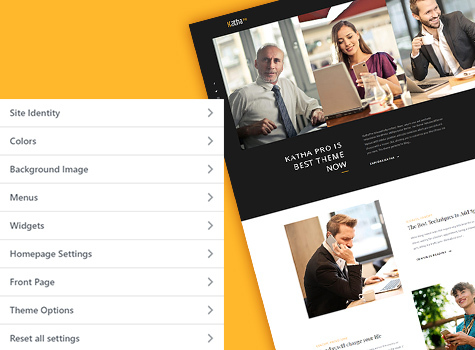 Katha Pro is an adaptable platform that can readily service all manners of websites across an endless range of niches and markets with effortless ease, quickly shifting its shape and look to match your most extreme specifications. Websites with a clean design often focus on practicality and efficiency. Katha Pro can drive your visions and dreams into actions and dazzle your clients with it’s comprehensible and clean design. Your interface will be streamlined and modern, resulting in a superior browsing experience for your website visitors and it also has smart theme options panel that allows you to adjust certain design elements to go well with your branding needs. Having a responsive design will not only ensure your content stays readable at all times, it will also help you get more web traffic effortlessly. This is the beauty of Katha Pro. 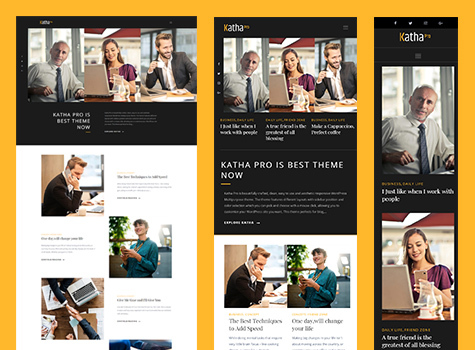 Katha Pro is fully responsive and retina ready- which means that the layout of the theme is designed to adapt to virtually any screen size and also shows more pixels per square inch, resulting in sharper images. As a result, your website will be accessible to all visitors, regardless of whichever device they use to browse the Internet. Your audience will find themselves right at home on your website from day one, owing the powerfully intuitive and universally familiar design philosophy used by Katha Pro. Besides, with a live customizer incorporated, you will be able to preview the changes made to your WordPress website in real time before pushing them live. 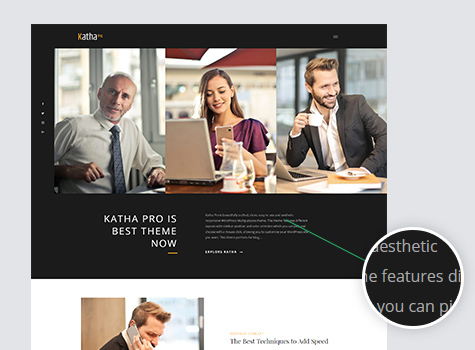 Katha Pro is refined and aesthetically versatile, user friendly and very easy to use, allowing you to build a feature- rich and powerful website so you can benefit from your artistic and creative freedom, even if you don't have coding skills. With Katha Pro, there is no limit to what can be achieved. 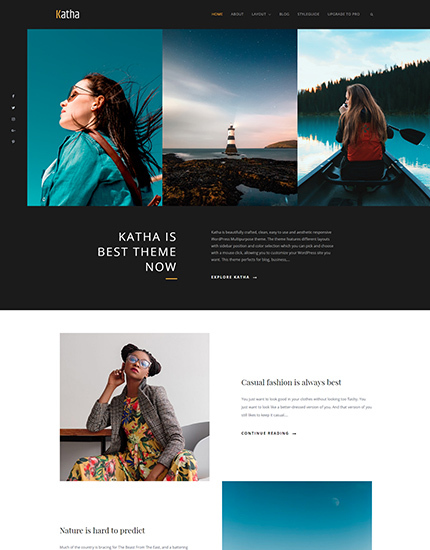 It allows you to setup a professional online portfolio for your own videos so whether you want to post your vlogs, publish video news or somewhere in between, Katha Pro has a video supportive portfolio to match your needs. 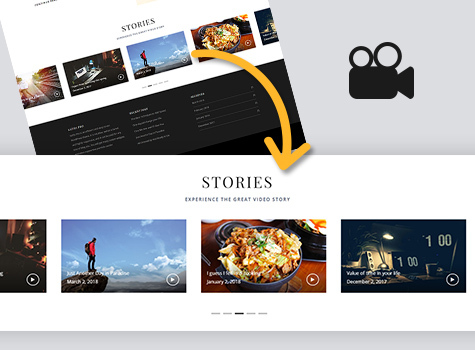 You’ll be able to display many of your best videos on the homepage of your site. This should give you ample opportunities to catch the attention of your visitors as soon as they arrive at your homepage. From video portfolios and magazine websites with video content, Katha Pro is more than up to the challenge of setting up this type of project.